Having turned only pens in the past, I was excited to turn the spindles that will pin the legs to the runners on the sawbuck table. Owning few lathe tools and possessing a miniscule amount of knowledge about woodturning results in an inevitable learning experience. I turned two spindles at a time on my mini-lathe. The first spindle took several hours to complete but the second one was turned in about 45 minutes. It did take a while to figure out how to use the tools... and how not to use them. Lesson one: lathe tools will let you know when you've mish andled them. 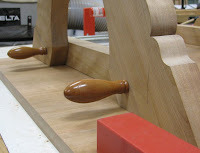 The first set of spindles were turned facing one another, with the skinny part of the pegs connected in the center. Lesson two: wood becomes springy if the expanse of a thin section is too great; the wood will deflect as you run a lathe tool along its length. Therefore, the second set was turned with the handles (the fat part) positioned back to back. The spindles on the orginal table are missing, so I mimicked the shape of the handles on a friend's antique turning saw. I did, however, know the location of the pegs from photos that I had taken at the Landis Valley Museum. 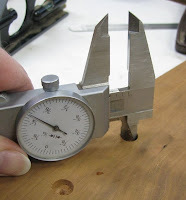 I used inside calipers to measure the size of the hole and outside calipers to check the size of the peg that would fit into the hole. Lesson three: don't regret having purchased an expensive set of calipers years ago, even though this was the first time you ever used them. 5 coats of blonde shellac were applied to the completed spindles while they were still secured, and spinning, on the lathe. A learning experience it was, but this was perhaps the most important lesson of all: signing up for a wo odturning class would probably be a very good idea.